Now that you have a spring cleaning list in your grasp, you might be better served with some sort of timetable, or schedule — to squeeze it all in before too much time passes. It’s not called spring cleaning for nothing you know! What Is Spring Cleaning and What Does It Involve? The type of spring cleaning that I referenced in my earlier post is really all about reorganizing, getting rid of unused/unwanted items, switching cool weather items for warm weather items (bedding, clothes, drapes, etc), and cleaning things around the house that really do not require weekly or even monthly attention. Visualize annual or semi-annual cleaning, and that should put what needs to be cleaned/organized in better perspective. a lot of elbow grease! What About The Things That Need More Than Just Elbow Grease? If your home is anything like ours, you’ve got an over-abundance of cleaning products. 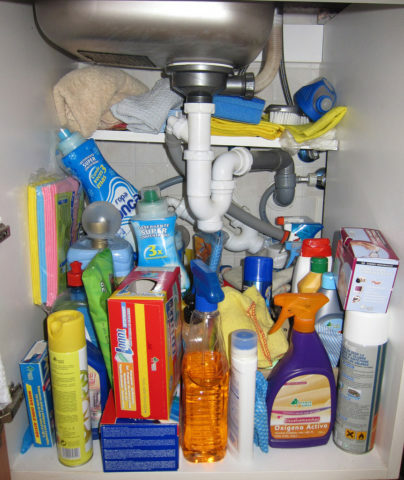 I (quickly) located 27 different household cleaning products under cabinets and in the laundry room. If you figure around $5 a product on average, that comes up to $135! Why do we have all of these specialty cleaning products in our home? Can’t we just get along with only a few and save money and space? Marketing can be an evil thing sometimes. We try different products to (hopefully) lighten our load and still get the job done right. That’s a standard goal of ours with the hectic life we’re livin’! We have a fiberglass shower stall in the master bath and it has a textured floor — so you don’t slip, fall down, go boom! It has always been the most difficult thing to clean in our house because of the tiny bumps in the floor. We have never been able to get it as clean as the walls, and it had a (slight) Georgia red clay stain on the floor in a couple of spots from the construction days. None really worked as we had hoped on the shower stall. But they each really do a great job elsewhere in the home. We also had high hopes for Mr. Clean Magic Erasers, but the textured surface chewed them to pieces before we got very far. So what cleaning product did we find to clean the shower floor? Kaboom Shower, Tub & Tile Cleaner! It’s been amazing at how well it cleans THE toughest stains around the house — including that darn shower floor and the rest of the shower stall. Best of all…no toxic fumes! Bruce No-Wax Floor Cleaner for our hardwood floors. Windex Glass Cleaner for interior windows. Windex Outdoor use it every Spring to clean the exterior windows. Hook it up to your garden hose and GO! Comet Cleanser with Bleach for the toilets. Also, the best product I’ve found to get the white lettering on tires white and return the tires to black. Soft Scrub for kitchen and bath counter tops and sinks. If you own a pressure washer, Zep House & Siding Pressure Wash Concentrate works great in that! Plain ol’ distilled white vinegar is great for many uses but we use it to deodorize the rabbit pens (pellet trays) when we clean them. Seventh Generation offers a full line of non-toxic, environmentally friendly products that work. Method has an extensive line of eco-friendly cleaning products that you can order on-line. Method’s co-founders, Adam Lowry and Eric Ryan, were featured in Vanity Fair’s annual Green Issue in May 2007 as the ‘The Cleanup Guys’ for ‘their work in propelling household cleaning to the next generation of clean – hip, non-toxic and environmentally friendly products.’ Seventh Generation CEO, Jeffrey Hollender was also featured in that same Vanity Fair article. And finally, here are some great cleaning tips from The Simple Dollar. Be sure to read the helpful commentary while you’re there.